With its wall-size map of New York City’s subway system, displays of toy trucks and automotive-themed sheets, this bright, contemporary bedroom is perfect for a transportation-loving child. 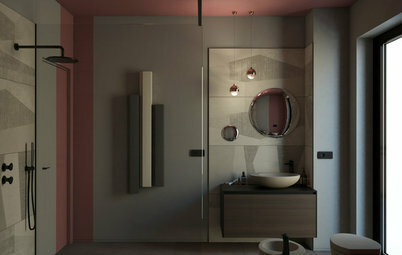 The white desk, storage cabinet and shelving unit blends in with the walls and contrasts with the room’s bold colours. 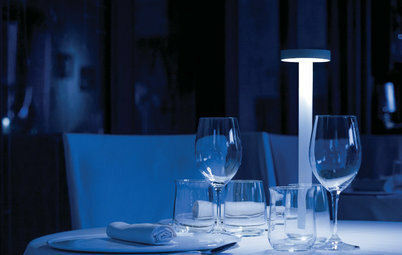 Under-shelf lights illuminate the desk and bed from above, and a desk lamp provides task lighting. Another bedroom with a contemporary built-in desk, closet and shelving unit has a different feel thanks to its muted wall paint and the cabinetry’s European white oak countertop and inset handles. 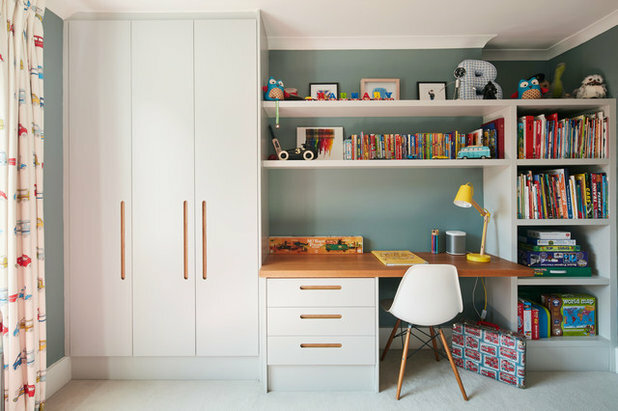 With lots of storage space for books, games, pictures and clothes, this London kids’ room helps keep things neat. 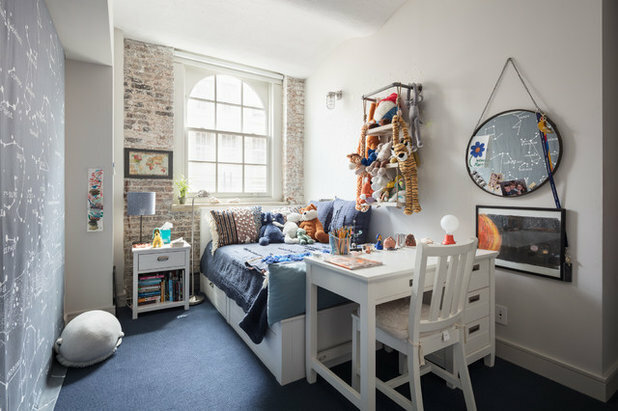 This bedroom in lower Manhattan, New York, makes good use of a narrow space with the placement of the sturdy desk and chair at the foot of the platform bed. The style and colour of the furniture ties in well to the elaborate window frame on the brick wall. The feature wall on the left, reflected in the round mirror opposite, and a framed artwork showcase the occupant’s interest in astronomy. A 3-year-old’s first big-girl bedroom can grow up with her, thanks to its neutral colour scheme, simple and practical desk and wall pieces to display things she loves. 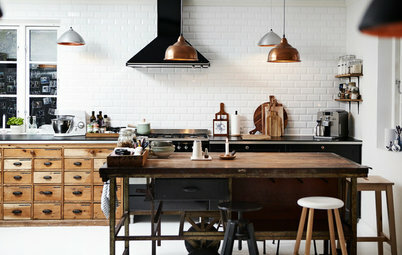 The room’s bright Scandinavian design is budget-friendly and stylish. The sports theme plays out top to bottom in this Southern California sports lover’s room. 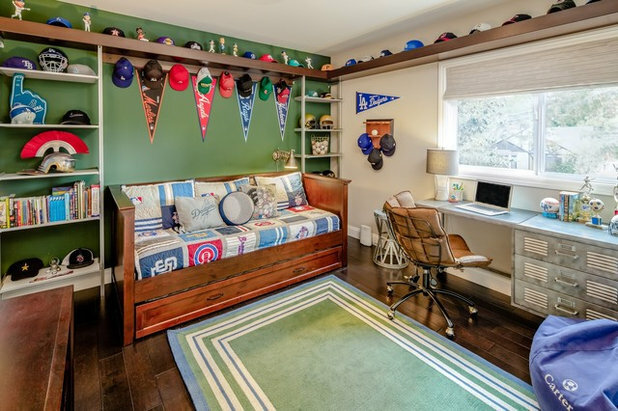 In addition to the team hats, pennants and other gear on display, and the field-green wall and rug, the room also features a locker desk with three wide drawers that resemble a row of sports lockers. And does the chair look a little like a baseball mitt to you? This desk, shelving and window seat with storage are part of a bedroom in a large farmhouse. A built-in like this can make use of an awkwardly shaped wall. The inset shelf also shows how you can create interest by painting the back of a bookcase with a standout colour. The coral pink is picked up on the Roman window shade and in a throw pillow on the window seat. A fluffy white desk chair adds another soft touch. With all the cute farm animals peeking out from the wall, a child studying in this bedroom need never feel alone. The glossy green six-drawer desk holds its own against the room’s colourful walls and graphic images. The desk’s position in front of the expansive window offers another view of nature. Holy cow, Batman! 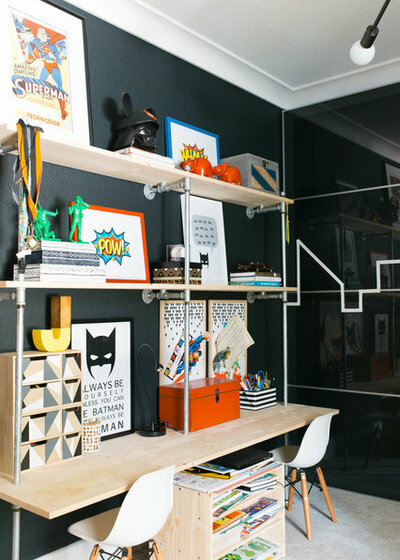 This is a fun desk area for young fans of the Caped Crusader and the Man of Steel. The industrial pipe desk displays illustrated artwork from the Batman and Superman franchises. The pipes are attached to the wall for support, and their lines echo the skyline on the adjacent closet doors. Black walls heighten the bedroom’s urban feel. This teenager’s chic bedroom uses industrial pipe-style shelving to very different effect. The metal structure works with the other warm-toned hardware in the room. 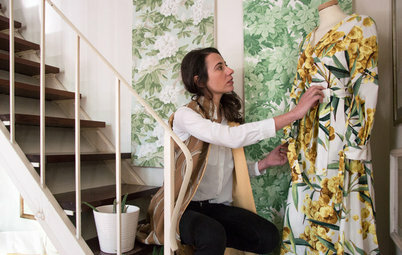 It also provides an earthy touch that grounds the glamorous space, which features millennial pink walls, ethereal drapes, a fluffy chair and a sparkly chandelier. Loft beds are a popular space-saving feature in kids’ bedrooms. The bed is on top, and below that is a desk or shelving, or both. This desk zone is well-equipped with a three-drawer storage unit, a pinboard and a long desk surface. The transitional room’s crisp navy-and-white decor gets energising splashes of orange from the S-shape chair, the desk lamp and other accessories. This pale, elegant bedroom features an elaborate custom furniture piece that was built on site. The desk, which has two sets of floating drawers, is sheltered beneath the platform bed. Under the staircase is a row of display shelves. Note also the fine detailing on the unit’s columns. The petite upholstered accent chair adds to the room’s classic style. This bedroom, just as thoughtfully designed as the previous room, has a rough-and-tumble look. The bunk and loft units sleep three and include a desk area for two with built-in cubbies. When a child needs a break from the books, a climbing wall is steps away. 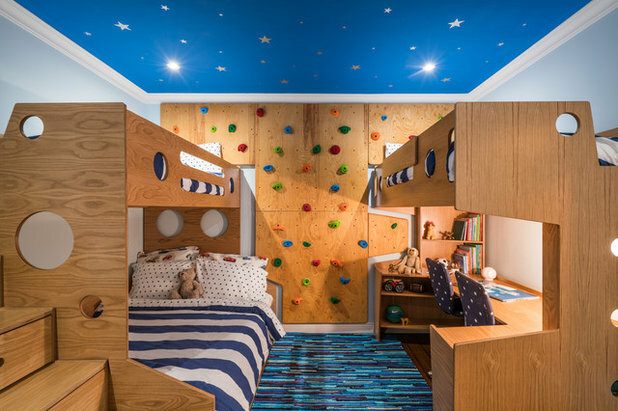 Staircase drawer storage, porthole cutouts, a starry ceiling and the vibrant blue colour scheme add to the appeal of this bedroom in Brooklyn, New York. Here’s yet another way to stack beds, desks and storage space in a kids’ room. This double loft unit in Sacramento, California, has a handsome look thanks to its gorgeous wood finish and smooth lines. The desks, with white facings, have space between them for more autonomy than a shared desk would provide. Inset desk shelves are built into the closet areas. The design of the unit and the dark wood fits in with the rest of the 1930s Spanish bungalow. 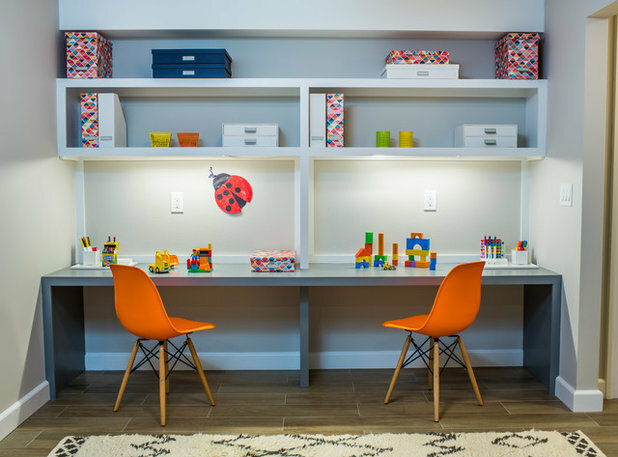 This dual desk area on the lower level of a Westchester, New York, home could be used by children or adults. The contemporary design features open shelving, undercabinet lighting and outlets for computers. This roomy dual study or office area also could be used by children or adults. The open space is located off the top of a staircase and hallway. The design of the built-in desk, shelving and window seating is of a piece with the New York home’s traditional style. Ergonomic chairs, a window seat cushion and office accessories add bursts of cheerful bright pastels. The window seat offers an inviting spot for relaxing, reading and daydreaming. Tangerine orange chairs and a sunny yellow wall panel bring this open and neutral reading and study area to life. The long desk is angled to create desks for two that are oriented in different directions. Extensive open shelving provides room for displaying books or objects. 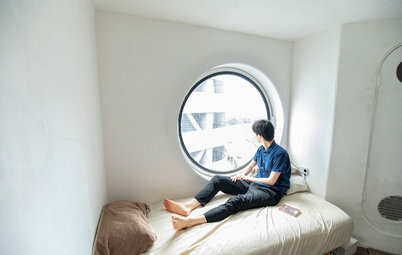 A large window lets abundant light into the room. A playful ceiling paint treatment, oversize pendant light, graphic wall map and vibrant desk for three create a dynamic atmosphere in this study area. It’s part of an apartment designed for a young couple with four kids. 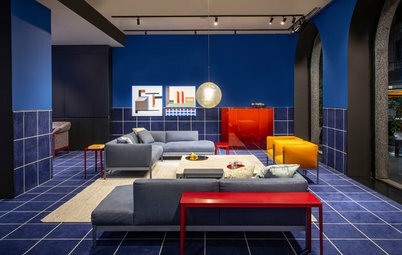 DLArchitecture aimed to make the parents’ living spaces stylish and elegant, and the kids’ areas creative and colourful. Black accents and dark metallics complement the rustic wood cabinetry in this children’s room on an Atlanta-area property. Note the raised area under the desk to support feet. 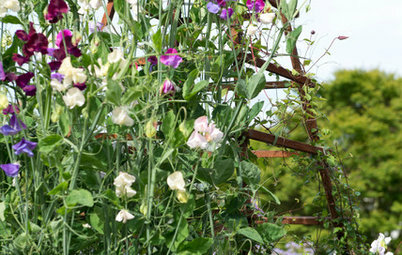 A large pegboard offers flexibility for hanging storage containers and other accessories. A tall window with a nice seating area brings in light and views. Some children, including younger ones, might prefer working at a table rather than a desk. 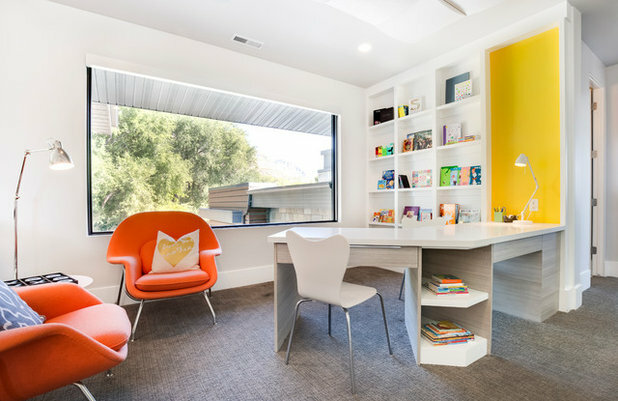 This homework room and reading nook for a family with three boys offers that option. 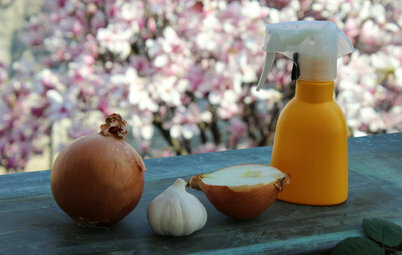 It’s located near kids’ bedrooms in a 1910 landmark limestone row house in Brooklyn, New York. 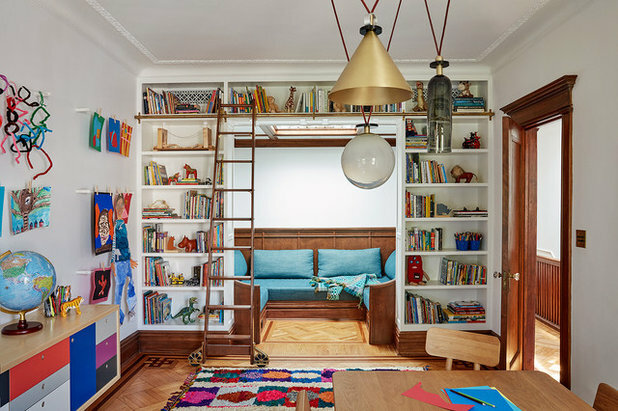 In renovating the home, CWB Architects kept the original plaster mouldings and woodwork while making the room child-friendly with modern furniture, a colourful rug and a wall display for kids’ artwork. 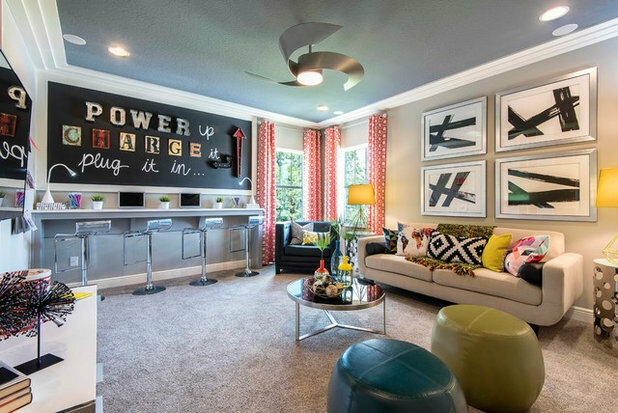 Designers turned a bonus room into a teen tech room and hangout. They custom made the blackboard wall and designed the built-in computer workstations. The room’s decor –including pendant light, wall art and throw pillows – conveys energy and movement, perfect for active teens. Kids can work at a computer or kick back with a book on the sofa or armchair. Which is your favourite study area, and why? Tell us in the Comments. Ogni mattina passi dei minuti a cercare questo o quell'altro prodotto di make up? È arrivato il momento di fare ordine! Comfort ambientale Dibattiti: Meglio Condizionatore o Deumidificatore?